THE PATTERNS DRAFTED BY HAND. Shirt #1 is made from Plaid Cotton Shirting fabric, and features bias details and a "Cigar Pocket". Shirt #2 is made from very average quality Cotton Oxford Cloth fabric, in a traditional design. Shirt #3 is made from Cotton Chambray fabric, and features a right front "Prince" seam, and a buttoned "Cigar Pocket"
Click HERE for a FREE PATTERN DIAGRAM for the "Cigar Pocket"
Sewing notes-- Fabrics from my shirt-making stash, PRO-WOVEN Fusible INTERFACING and BUTTONS from FASHION SEWING SUPPLY. I recently had a question via my Facebook page asking about shirt patterns that I would recommend. The styles and design features vary, but all the patterns are well drafted and each company provides good instructions. HotPatterns Princess Shirt, revisited in wool tweed. This is my first version of the up-dated draft of HotPatterns' Plain and Simple Princess Shirt. It was designed for shirting-weight fabrics, but because I wanted to make a simple "shirt jacket", I used a lightweight wool tweed instead. And since I plan to wear this over another top, I added 1/4" of ease to each side seam and the sleeve seams. I wanted to add pockets to this shirt jacket, but unfortunately did not have enough fabric. 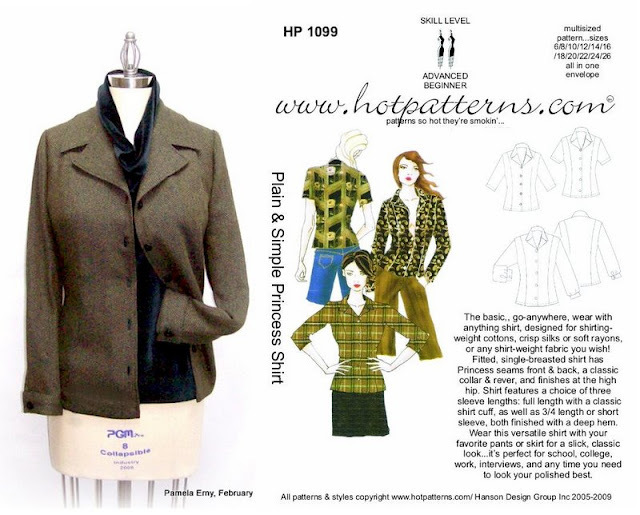 This pattern is a re-draft of one of HotPatterns' first styles. When comparing the original draft to this new one I was happy to discover that the changes were minor but ones that improved the fit, in my opinion. The most noticeable changes are a slightly lowered armscye, a slightly wider sleeve and the addition of a back neck facing. Subtle but effective changes that I think I will really appreciate when I make this style in lightweight fabrics...and I will be making this style again. It is one of those great patterns from which you can get a lot of "style mileage". Sewing notes: Facing and Collar interfaced with PRO-WEFT FUSIBLE from ~Fashion Sewing Supply~.